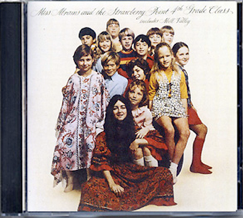 krismulkey.com: Remember the Mill Valley Song by Rita Abrams? Remember the Mill Valley Song by Rita Abrams? Just when we thought we were on the home stretch, sliding into summer we get zinged with one more project. All the third grade students were asked to do a project on something important in Marin County. Elli wasn't wigged out by this at all. She knew that we would make sure it got done. Which of course we did. The teachers gave the students a list of ideas. There are amazing things and people to write about here. There is a lot of history in this area because of our location. We are just north of the Golden Gate bridge. Our county is surrounded by water (The San Francisco Bay and Pacific ocean) there are all kinds of things related to water and nature to write about. There are all the amazing sea animals, and world renowned research facilities, Mount Tamalpais, the San Francisco Bay, historical events like the 1906 earthquake, the Miwok indians, and some of the original settlers whom many things are named after in our town, John Muir (Muir Woods), etc. There are endless things to research and write about. So what did Elli choose? 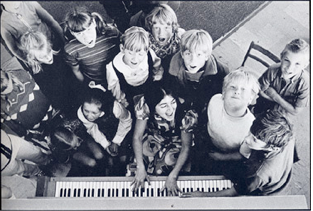 She chose to tell the kids about Rita Abrams, the kindergarten teacher who wrote the Mill Valley song back in 1969 which became a top 5 hit on the billboard charts. 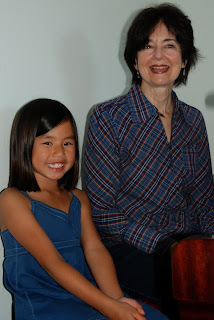 She was super excited to interview Rita, put together a dvd and write a report about her. It just so happens that Rita is our neighbor - which is how Elli got the idea. We met Rita last fall by accident. Elli had to raise $160 for her school walkathon. Since that's a lot of dough, I asked Elli go to door-to-door asking for support from our neighbors. One of the doors we knocked on belonged to Rita Abrams. We got to chatting and we've been friendly ever since. So when Elli got the end of year assignment - she immediately thought of Rita. Rita had just moved to Mill Valley and was really impressed with the sense of community that everyone had. She decided to write a song that her kindergarten students could sing. So she sat down at a popular spot in the middle of our little downtown and wrote the song in 15 minutes. Before she knew it the song was produced, on the radio, in Rolling Stone magazine and had become a Top 5 hit across the nation. Elli interviewed Rita and even got to sit down at her grand piano with her and sing the song. We recorded everything. Don edited the movie and Elli made a fantastic poster with photos, a written report and a copy of the dvd for her project. Here she is in 1970 in the photo that was taken by Annie Leibovitz for Rolling Stone magazine. It was Annie's first year at Rolling Stone. The record was produced by Eric Jacobsen. And even more amazing, the video of the kids singing was shot by up and coming director Frances Ford Coppola. He was in San Francisco then because he had just formed a company with George Lucas. Then in 1971 the Godfather was released. It went on to become one of the highest grossing films of all time. He got an Oscar for the screenplay and the film won the Best Picture award at the Academy Awards that year. Crazy, huh? Take a listen. Were you around in 1970? You might remember the song! WARNING: This catchy little tune may get stuck in your head. I find myself humming it all the time. Oh that is a wonderful song. So refreshing and delightful. I'm glad Elli had the experience to interview and get to know Rita....What fun for both of them..